IronKey is one of the better known examples of “secure flash drive,” a category of products targeted at enterprises and security-conscious users for portable storage with hardware encryption. From a certain perspective, this entire category owes its existence to a failure of smart card adoption in the same target market. All of the functionality of dedicated hardware encryption products can be implemented with equal or better security, at much lower cost and greater flexibility using general purpose smart cards and off-the-shelf software. 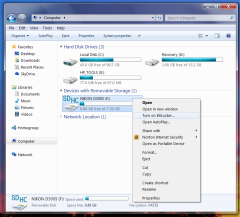 Case in point: BitLocker-To-Go (“B2LG” for short) available in Windows 7 and later versions, provides full disk encryption for any old USB drive, with keys managed externally. B2LG is closely related to the original Bitlocker feature introduced in Vista, which protected boot volumes with the help of a trusted platform module. The latter is a more difficult proposition, as booting a modern OS involves several stages, each depending on executing code from the encrypted disk. Maintaining integrity of this code loaded during boot is as much of a concern as confidentiality, because altering the operating system can be an avenue of bypass against disk encryption. By contrast B2LG is concerned strictly with reading data after the OS has been already booted into a steady state. 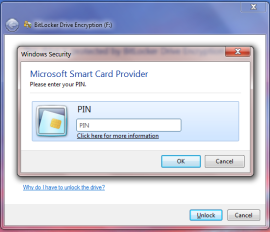 Choosing between passphrase and smart card, when enabling BitLocker. The first configuration is susceptible to the usual offline guessing attacks, much like Android disk encryption, because keys are derived from a low-entropy secret chosen by the user. In the second configuration, the bulk-data encryption key is randomly and sealed using a public-key associated with the smart card. Unsealing that to recover the original key can only be done by asking the card to perform a private key operation, which is what smart cards are designed to implement with high security. PIN dialog during private key operation to unlock a volume protected by BitLocker To Go. In both cases there is a limit to online guessing attacks by trying different PIN/password choices. For dedicated drives, the retry count is typically fixed by the manufacturer. For BL2G, it depends on the application installed on the card, translating into more flexibility. For those comforted by external validation, there are many smart cards with FIPS 140 level 3 certification (as well as Common Criteria EAL 5+) in much the same way that many of the drives boast FIPS compliance. Again BL2G provides for greater choice here: instead of being stuck with the specific brand of tamper-resistant hardware the drive manufacturer decided to use, an enterprise or end-user can go with their own trusted card/token model. BL2G has better resilience against physical theft: an attacker would have to capture the drive and the card, before they get to worrying about user PIN. If only the drive itself is lost, any data residing there can be rendered useless by destroying the cryptographic keys on the smart card. By contrast a lost IronKey is a permanent liability, just in case the attackers discover the password in the future. Neither approach is resilient against local malware. 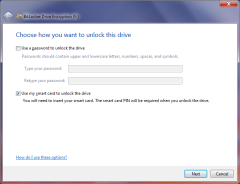 If the drives are unlocked while attached to a compromised machine, all stored data is at risk. Some smart cards can support external PIN entry, in which case local malware can not observe the PIN by watching keystrokes. But this is little consolation, as malware can request the card to perform any operation while connected. Similarly while the IronKey PIN must be collected on PC and subject to interception, there are other models such as Aegis Secure Key with their own integrated PIN pad. The second part of this post will look at other dimensions, such as performance, cost effectiveness and scaling, where BitLocker & smart card combination enjoys a decisive advantage over dedicated hardware.